Every now and then I come across a restaurant that reminds me why I love my job. 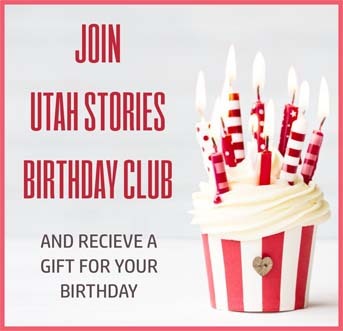 Such is the case with Twisted Fern, a hidden gem in Park City – a town with more than its fair share of excellent eateries. Don’t let the location dissuade. Twisted Fern is located in Park City’s Snow Creek Shopping Center, but this is far from your average strip mall dining spot. For starters, the restaurant is located on the far east end of the shopping center with views of wild nature, especially from the shady courtyard located on the side of the restaurant. You’d actually see and hear more traffic sitting on a Main Street dining deck than you do at Twisted Fern, which is blissfully serene. Oh, and parking is a cinch too. No need to fight and pay for a space like in Old Town. I suppose you’d categorize the food at Twisted Fern as “new American cuisine.” But that moniker never really means much to me. 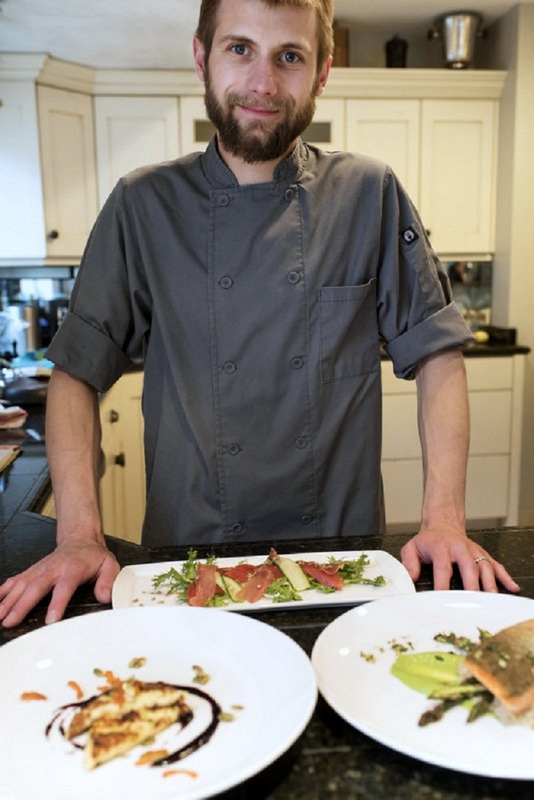 Whatever you label it, Chef/Owner Adam Ross is producing mostly from-scratch, minimally processed, totally innovative and delicious meals with a heavy emphasis on utilizing fresh, in-season, local (or near-local) products. I was a little surprised to learn that Ross’ previous gig was as chef at Bistro 412, a perfectly fine restaurant but a French-style bistro that wasn’t exactly known for its uniqueness. Take the starters section of the dinner menu, for example. It’s far from the same old same old, with offerings like smoked eggplant Caprese salad ($10), crispy garlic and sesame chickpeas ($4) and confit of chicken wings with housemade sriracha, blue cheese cream and pickled carrot. 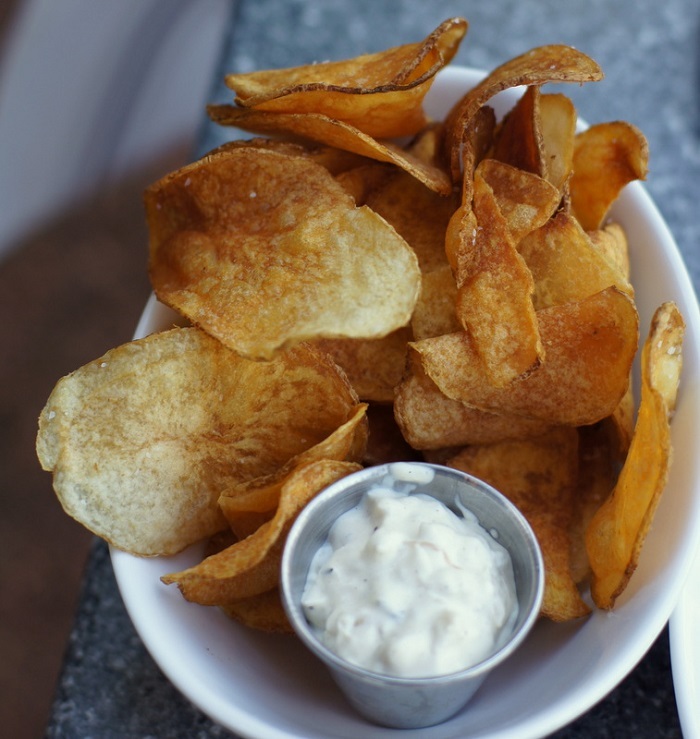 Even something as simple as housemade potato chips are special, accompanied by a light-and-airy, but totally addictive whiskey-French onion dip. My wife and I nearly came to fisticuffs over the third piece of the blackened octopus appetizer we shared. 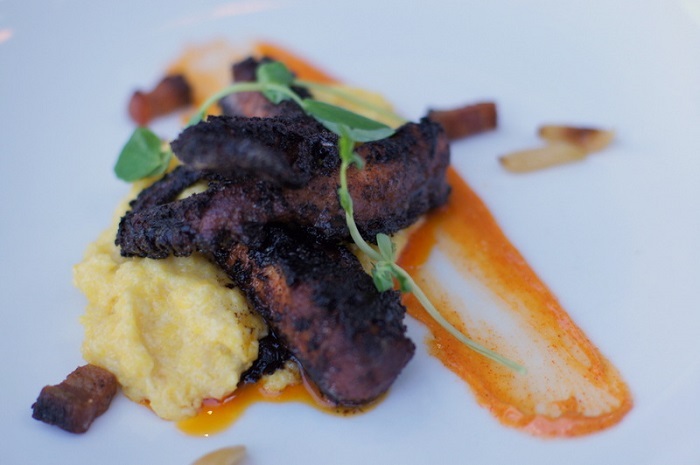 My first thought about blackened octopus was, “There is a lot that can go wrong here.” But I was the one in the wrong. I had fully expected the octopus to be tough and chewy. Nope. It couldn’t have been more tender, having been first marinated and cryovaced in a red wine bath with cinnamon, herbs and other spices. You’re thinking the same thing I was: octopus and cinnamon? Hey, it works. The cinnamon is oh-so subtle, and served with saffron polenta, a smear of paprika aioli, Hugo Coffee-rubbed lardons and mild roasted garlic, this dish is really sensational. 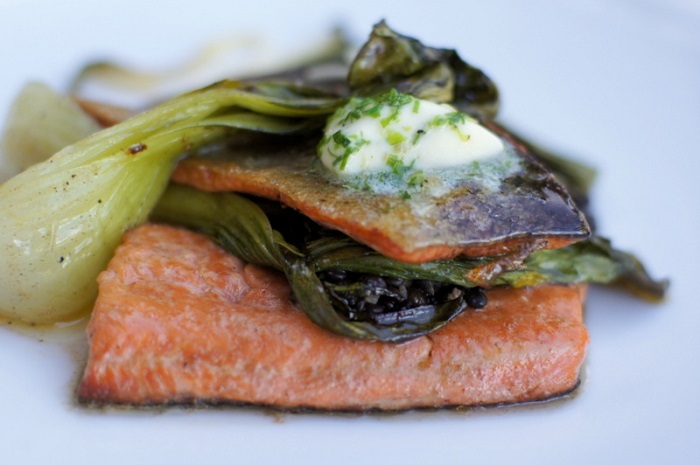 Folks with dietary restrictions – particularly those looking to dine gluten-free – will love Twisted Fern. Perusing the current menu, out of 21 starters, salads and entrees, only five were not gluten-free. This made my wife ecstatic. And four of those five dishes failed the gluten-free test because they contained bread, whether for burgers or sandwiches, or in the case of a baked goat cheese appetizer, the Drake’s Family Farms chevre is served with yummy stick bread. Service at Twisted Fern is far above par, with General Manager Eamon McCormick keeping a keen, friendly eye on things and servers like Jess topping off wine glasses and answering tricky questions about the eclectic menu. This is a small restaurant with an equally small, but seemingly overqualified staff. Again, don’t let the location fool you. As for chef Ross, he’s been cooking since the age of eight, when he began experimenting in his mom’s bakery. As the story goes, “Eight-year-olds weren’t allowed to prepare baked goods for human customers, so Adam honed his skills creating dog treats,” which came to be known as Adam’s Dog Biscuits. Those must have been some well-fed pups! 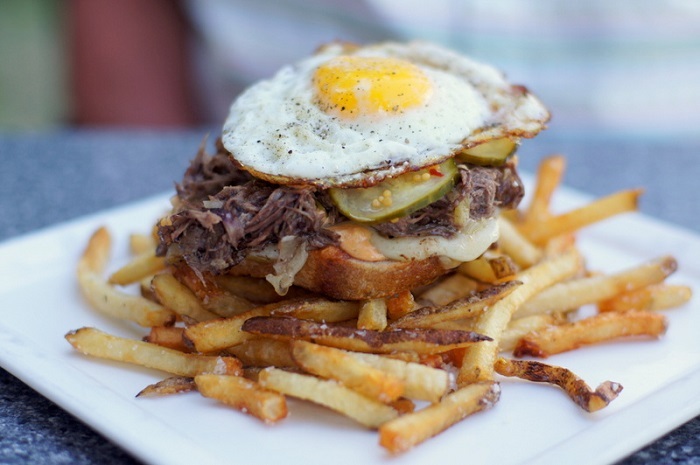 And speaking of well-fed, that’s how I was feeling while loving Ross’ Shorty Melt ($16), an open-face braised short rib sandwich on toasted rye bread with Gruyere cheese, garlic pickles, homemade 1000 island dressing, and apple-bacon sauerkraut, topped with a perfect fried egg. The shredded meat from the short ribs was ridiculously tender and I loved everything about this sandwich, including the slightly sweet garlic pickles. As a bonus, the Shorty Melt comes with what just might be the best French fries I’ve had in Utah. They were fried spud perfection. My wife was equally pleased with her tasty trout entree ($26), featuring fresh trout from Southern Utah with pickled ramps and ramp butter, roasted bok choy and beluga lentils. All of that would have been quite enough. However, we were celebrating my birthday and our anniversary (we got married on my birthday, so I never forget the date of our anniversary!). And Eamon insisted that we enjoy a dessert on the house. I’m glad he did, since it was one of the best desserts I’ve gotten my lips around in quite a while. 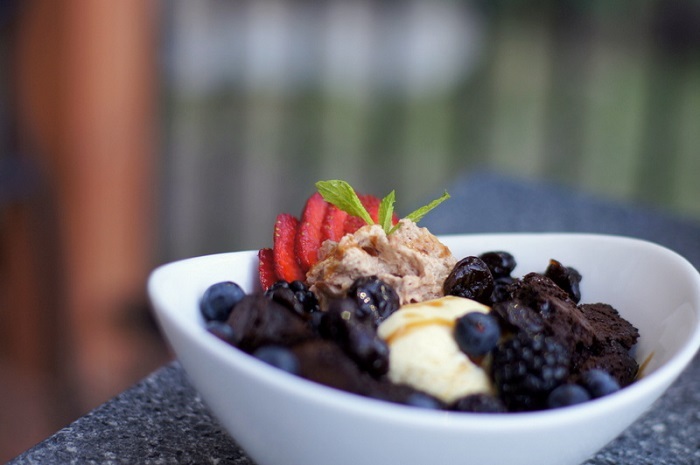 The Brownie Sundae ($7) is a rich, dark chocolate brownie with Wasatch Creamery ice cream, chocolate mousse, bourbon cherries, blueberries, blackberries and strawberries – truly delightful. Unique, eclectic, comfy, innovative … all those words describe the food and vibe at Twisted Fern. 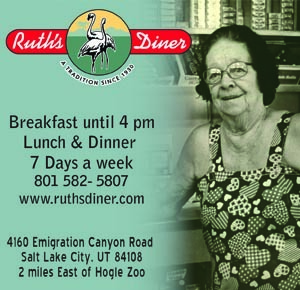 For me, this isn’t just one of Park City’s best restaurants, but one of Utah’s finest.